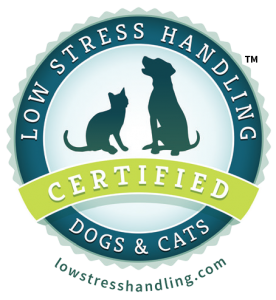 What is Low Stress Handling Certification and how does it benefit your pet? Low Stress Handling enables us to approach and physically interact with anxious dogs and cats in ways that help to decrease their fearfulness and makes the experience less traumatic for them. Our Low Stress Handling Certification means that all our veterinary assistants, as well as myself (Dr. Williams) have taken, and passed the Low Stress Handling Certification course. This course is based on the work of Dr. Sophia Yin, a veterinarian, animal behavior specialist, and internationally renowned expert on Low Stress Handling. Her ͞pet-friendly͟ techniques for handling and behavior modification form the foundation for this training. The course has taught us how to recognize not only the overt, but also more subtle signs of fear and anxiety in our patients. We have learned the common mistakes made when approaching animals that are fearful and/or aggressive, and how to approach them in a more relaxed, non-threatening way. We learned about strategies such as counter conditioning pets to fearful situations, as well as a variety of different methods of restraining the fearful pet. I have been a veterinarian for over 30 years and thought I was pretty good at ͞reading͟ animals, but this course has totally changed my approach to the fearful/anxious patient. As a result, we have far fewer͞ problem͟ pets, who might in the past have required sedation in order for us to examine or perform various procedures such as blood draws and vaccinations. This is not only beneficial for us, but more importantly, it benefits the pets. Being handled and subjected to various procedures can be extremely stressful for the fearful pet and the stress builds after each unpleasant experience. By using the appropriate techniques the pet has a much more positive experience and we are able to provide better quality care.